The TDCJ, which runs Texas prisons and houses more than 146,000 inmates, is currently in the middle of litigation over what inmates and advocates have said is deadly heat in its facilities. But Texas is not the only state facing such lawsuits. Louisiana is defending its refusal to install air conditioning on death row, while prisons and jails across the country have been ordered by courts to address their sweltering temperatures and extend protections to inmates, particularly the ill and elderly. A spokesperson for TDCJ wrote in a statement to The Intercept that “the well-being of staff and offenders is a top priority for the agency and we remain committed to making sure that both are safe during the extreme heat.” He said that only 30 of the state’s 109 prisons have air conditioning in all inmate housing areas, because many were built before that became a common feature and retrofitting them would be “extremely expensive.” Instead, he said, the agency has taken measures like offering water and ice, restricting inmate activities, and training staff to recognize heat-related illness. The spokesperson said that inmates have “the ability to access water throughout the day” and that ice and water coolers are refilled continuously — contradicting the accounts of inmates who said that ice rations are often reduced and sometimes outright denied, that in some facilities they are given no ice or cold water for days at a time, that ice is so scarce that inmates will buy it off each other, and that inmates residing in a given cell block are given ice water to pass down the row of cells, which often leads to violence and hoarding of the vital resource. Hernandez, the Price Daniel Unit inmate, acknowledged that prison officials there took some “precautionary measures,” like the water cooler and placing fans in common areas of the prison, but said that was hardly enough. Inmates have fans in their cells only if they can afford to buy them from the prison commissary, and “once the temperature exceeds 95 degrees Fahrenheit, the fans simply circulate hot air,” he wrote. In a 2014 report documenting the “deadly heat” inside Texas prisons, researchers with the University of Texas School of Law’s Human Rights Clinic found that since 2007, at least 14 inmates had died from extreme heat exposure in prisons across the state. The report documented at length the failures of prison officials to prevent heat-related injury to inmates and concluded with a series of recommendations, including frequent monitoring of inmates at higher risk and the installation of air conditioning to ensure temperatures do not exceed 85 degrees. A year later, nothing had changed, and the same researchers issued a second report condemning the “reckless indifference” of prison authorities. 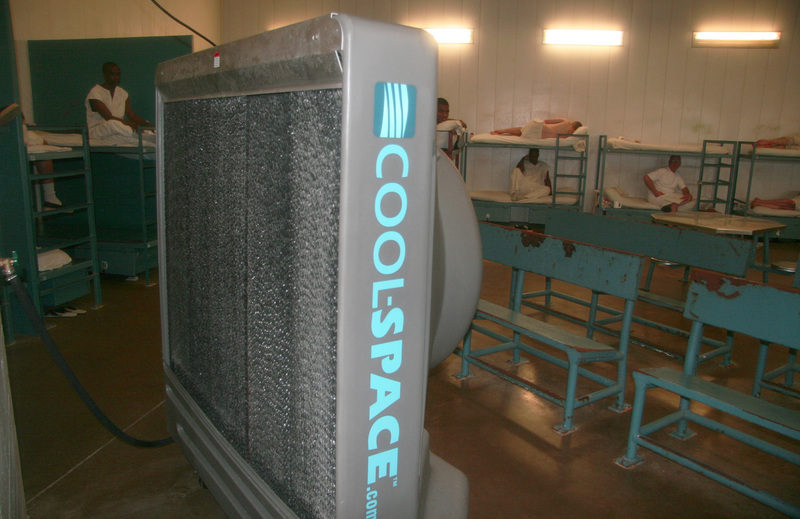 A cooling fan in a cell at the Texas Department of Criminal Justice Holliday Unit near Huntsville, Texas, June 20, 2014. Fred Wallace, a 72-year-old plaintiff who is clinically obese and suffers from high blood pressure, said in a statement read by his lawyer that one day he felt he was going to pass out from the heat and asked a guard if he could go to the prison’s barber shop, a cooler area. He was denied permission. But Texas, which has not set a maximum temperature standard for its prisons, is hardly unique. There’s no national standard for temperatures in prisons and jails, and as jurisdiction over prisons is decentralized among states and the federal system, and jurisdiction over jails is even more fragmented among thousands of local authorities across the country, fights over excessive heat in detention can only be waged facility by facility. “The only national standard we have is the Eighth Amendment to the Constitution, which prohibits cruel and unusual punishment,” David Fathi, director of the American Civil Liberties Union National Prison Project, told The Intercept. A spokesperson for the Bureau of Prisons confirmed that “there are not any federal regulations concerning temperature control in federal prisons,” pointing instead to “guidelines” in a Facilities Operations Manual that discuss ventilation and set target temperatures at 76 degrees in the summer and 68 in the winter. The guidelines also note that due to the facilities’ age, “occupants may experience a range of temperatures in their space that is a few degrees on either side of the targeted set point.” Those standards do not apply to state and local facilities, which can vary widely. But while it’s true that many of the country’s facilities are old and ill-equipped, that’s no excuse for failing to provide inmates with constitutionally required safe and humane housing, critics say. And politics, more than money, is often the obstacle. Jackson declined to comment on the pending case, as did the Louisiana Department of Public Safety and Corrections. But the department’s secretary Jimmy LeBlanc told the Associated Press in June that installing air conditioning at Angola would open a “Pandora’s box.” “My biggest concern is the impact on the whole system and the cost,” he said. Critics say the real problem is the political cost of being perceived as granting “luxuries” to prisoners. So far, the ACLU and other rights groups have been making that case one facility at a time. In Wisconsin, they won a court order to air-condition a prison where temperatures were reaching “potentially lethal levels.” In Mississippi, they won an order to provide fans, iced water, and daily showers when the heat index exceeds 90 degrees. They also secured protections for inmates more susceptible to heat-related injury at the Baltimore City Jail. In the Maricopa County jail in Arizona, run by Sheriff Joe Arpaio, the ACLU won an order that inmates on certain kinds of medication that make them more vulnerable to heat be housed in temperatures of 85 degrees or below. “Unfortunately, because we have this very decentralized criminal justice system, you have to fight it out state by state and facility by facility” said Fathi.